I love Tula Pink and I was so excited to see your Market Posts. I read every post but don't always comment. You might think I'm a stalker. Ha! Love all that you do too. Your patterns are so wonderful. I want to make Ballerina in Parisville. I loved the market posts but didn't comment - I'm quiet in real life, too. I always read them, too, but lots of times don't comment. I always feel if I don't have something original to say, why say anything. Maybe I should rethink that! I love reading market posts! I'm just a quiet gal, and don't often comment :) I'm not tired of them though. Thank you for giving us a piece of market. Yes, please more pics from quilt market. Since I didn't get to go, but I'll see you in Portland next year, of course I love the pictures! I'm ashamed to admit that I don't comment as often as I should. I have enjoyed the posts and the pics immensely! Thanks. I love seeing all the pics of Market.I know I will never get the opportunity to see it. I find it gives ideas. I'm laughing a bit about your comment on comments. I live for comments on my blog, but since I do most of my blog reading via google reader on my ipod, commenting on them isn't the easiest. So I'm very guilty of not commenting even though I like a post. After all that, love the pictures of Tula's booth. I'm such a fan of her stuff! And I can't wait to see the new things you have in store for us. No pressure! Lol - that's funny about the comments. Sorry if you felt neglected. :-) I know what it's like when a post gets just a comment or two (or none)! I tend to comment less on blogs where the comment counts are almost always high so while I read every post of yours, I don't comment very often. I love everyone's market recaps and it makes me wish I had been there. The last couple of posts on the market weren't about YOUR work so while I really enjoyed them, I didn't really have anything to say about it here. love Tula Pink! 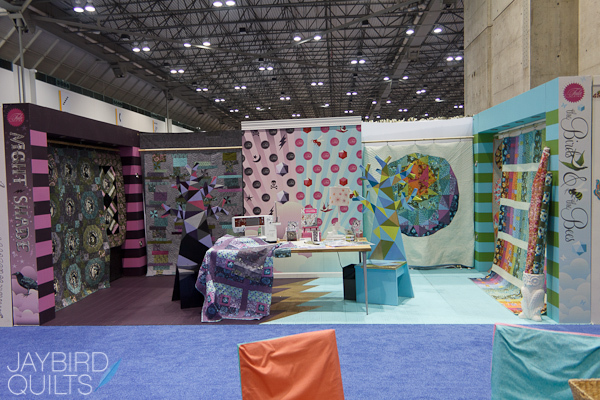 Thanks for sharing pics of her booth. Somehow I missed the last post and surely would have commented on the elephants! How neat they are! More quilts please...and sorry for not posting, as sometimes I lurk about forgetting to post. i read in google reader so don't usually add comments. I like seeing different pictures, but have seen a lot of the same thing. The Tula Pink is different. 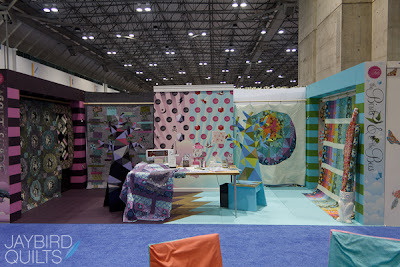 But a lot of the posts on the blog world are mostly general "here is ABC booth" "here is me and designer xyz" I'm over it. With hardly any time it seems this summer, I cruise blog photos and read only bits... and comment even less. I love you market pictures! Yes I love all the market posts, though I don't always comment. 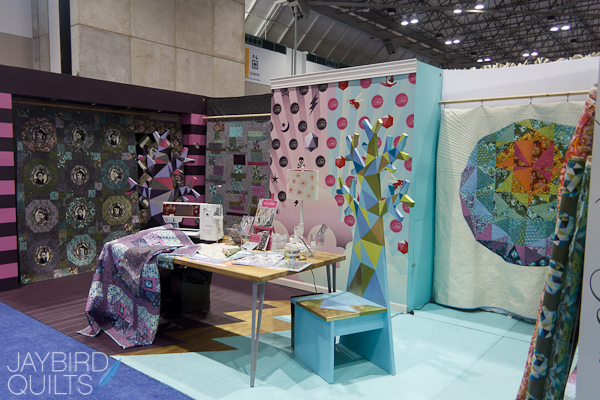 It was fun seeing the Quilt Market picks. 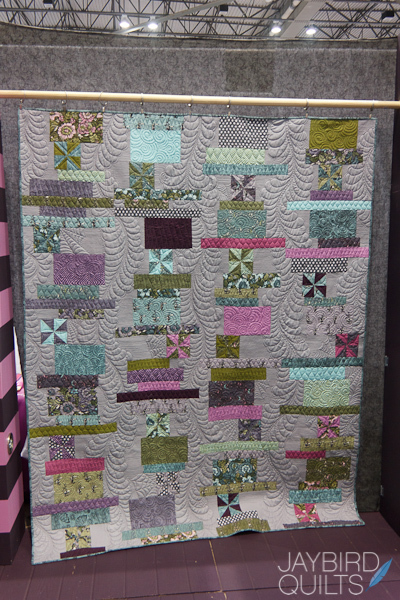 I really loved the Feather's quilt quilted by Angela Walters. 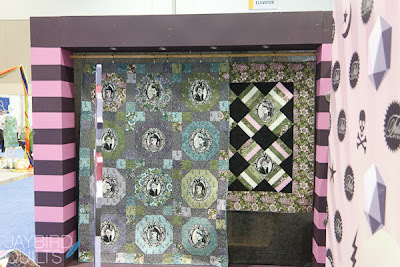 Love the Tula Pink's fabrics too. Yes, please more pics from quilt market.Thanks. I know I will never get the opportunity to see it. I find it gives ideas. As everyone else has said, I'm always reading blogs, but I'm not always good about commenting! I have to comment on this post though because my love for Tula runs deep! 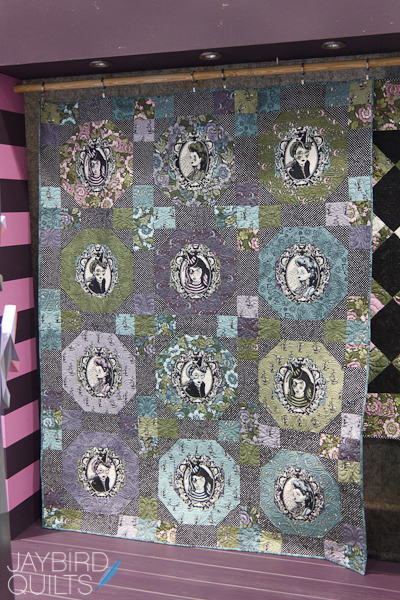 Even though I have way more projects than I count, I couldn't resist cutting into Night Shade to make a Ballerina quilt, just like the one on the cover. Not very original of me I know, but I fell in love the moment I saw it! Thanks for sharing your photos from Market with us! Well hopefully everyone will comment on this one. I love your posts Julie and read them first when they come in my email but I forget to always comment. I suppose that is the bad with email subscriptions. I have to say I have really enjoyed everyone pics and continue too! 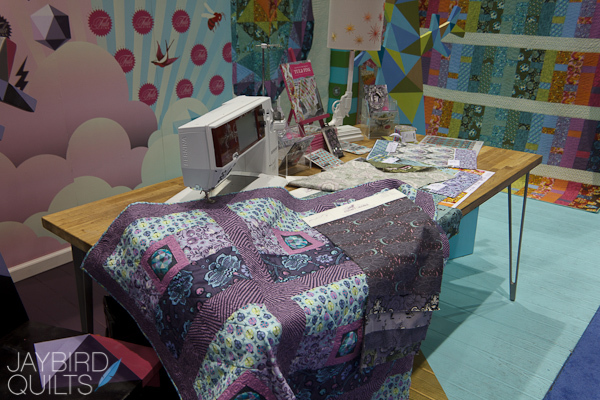 I love Tula's chairs, wouldn't it be fun to have one in the sewing room. So please keep it coming, I am here happily reading and will try to comment more! keep the market photos coming : ) For those of us who didn't get to go....it's wonderful. I would like more photos Julie - wish I could go, but this is the next best thing to not going.. I'm sorry. I guess without feedback you just have no way of knowing. I get feeds from your blog in my email so I just read them there and don't comment. I LOVE the market pictures and am always happy to live vicariously through you (or anyone else that posts them). I always think I have hit the jackpot when I get one comment!! Love the photos, all of them. Tula is very special and I can't wait to get my hand on Birds and Bees! Maybe a Ballerina!!! I love seeing Tula Pink's fabrics. 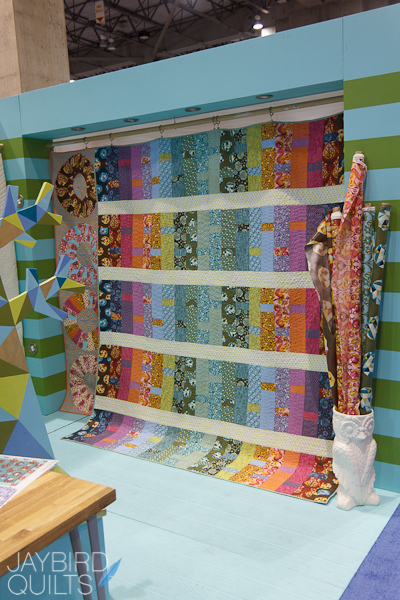 I have been to her mother's quilt store in Missouri - great shop. I thnk Tula has been a big asset to Moda. 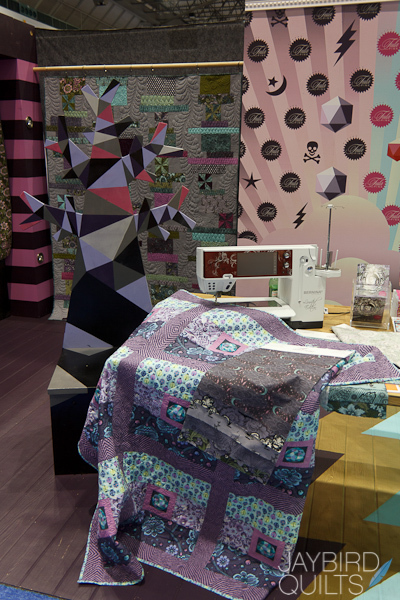 Her fresh fabrics are so much fun to work with. Since most of us do not get to Market, we are always ready for photos - especially if you see someone new. I have found myself signed up for so many blogs, that I don't always comment. But I read them all. I love the purple hues in this fabric line. Thanks, Julie, for sharing. I love seeing as much as I can about market. Someday maybe I'll be there too. I'd love to talk with you about your pattern business. Any pointers for newbies like myself? Also, I <3 Tula Pink forever. sorry I only had time to peek and run... but I've been enjoying all the posts from Spring Market - don't be shy about posting more Market pics! I have enjoyed reading your blogs and looking at your wonderful work. I have just started blogging and would love for you and your friends to join me as sometimes it seems I'm alone. Thank you and I can't wait to see all that you do :) Kathy at www.sewcraftykathy.blogspot.com I just went to my first Quilting show at Wilmington NC and I loved it! I don't comment very often either but I love your patterns and your blog. I check three blogs daily to see if there is anything posted - yours, Sweetwater, & Oh Fransson. When you don't post for awhile, I just hope that nothing is wrong and wait for you to post some wonderful new project! You are so talented and have such a great family! I like the Market Posts - Love Tula Pink too - I was on vacation and working my real job too much- love your blog! Most of my energy with market posts (anyone's) usually goes into looking into the various people/patterns/fabrics being referenced, rather than commenting. There must be a lot of editing, photo selection, etc. that goes into these posts, so I can understand why your own commentary tends to be somewhat limited. That said, you might get more comment if you were giving more commentary (though it's okay if you don't). Certainly those who are visiting your site are visiting for your point of view and it's always a feature when you offer it. I am more of a reader of blogs than a commenter! I love seeing what you post and am curious about what you are currently working on! 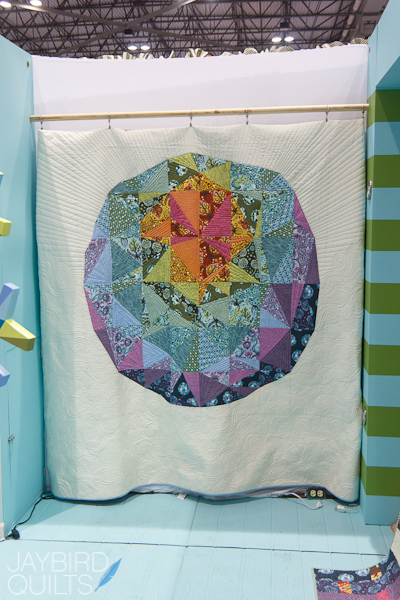 I love your patterns and creativity! You are an inspiration! I have to say, I never knew much about Tula Pink, but all the cute things you post on your blog makes me realize what I have been missing!! I love the new Nightshade line! I read your posts -- just am frugal with comments because it takes so long on dial-up. You have the best Tula Pink Market photo journal I've seen.